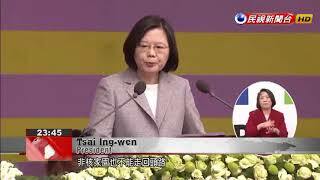 On Taiwan's National Day, President Tsai Ing-wen delivered her annual Double Ten Address from the Presidential Office. She opened her speech today with cross-strait issues, denouncing China for its, quote, "unilateral diplomatic offensive and military coercion." She then took a softer stance and said that Taiwan would neither escalate confrontation, nor will it give in. As for her reform efforts, she acknowledged that reforms may be painful to carry out, but the next generation will appreciate the choices that are made today. In the face of China’s attempts to challenge the status quo in the region, President Tsai went right to the point, focusing on cross-strait relations in her National Day address. China's unilateral diplomatic offensive and military coercion have not only harmed cross-strait relations. They have also seriously challenged the status quo of peace and stability in the Taiwan Strait. The best way to defend Taiwan is to make it indispensable and irreplaceable to the world. I am calling on the authorities in Beijing to play a positive role in the region and the world, instead of being a source of conflict. As president, I want to assure everyone that we will neither act rashly to escalate confrontation, nor will we give in. Tsai emphasized that her country won’t wilt under pressure and that Taiwan will deal with issues that stem from its domestic reforms. There is no turning back from pension reform, because we cannot allow every succeeding generation to teeter on the edge of financial crisis. There is also no turning back from a nuclear-free homeland. And we can never turn back from transitional justice. Previous administrations made mistakes, and this administration must bravely face them. Reforms may be painful, but in 10 or 20 years, the next generation will appreciate the choices we make today. Tsai called on this year’s National Day representatives to act as the world’s metaphorical beacons of democracy. Taiwan is a beacon. Our democratic transition once illuminated our own path through the darkness, and remains a beacon in the night for those who long for democracy. So to all of our friends who are pursuing democracy in Hong Kong, in mainland China, and around the world: You can always look to Taiwan, because Taiwan's democracy lights up the world. Now into her third year as President, Tsai is endeavoring to find room for Taiwan to grow in an ever-changing world where Taiwan, China and the US co-exist in a delicate balance.